Peel the onions and cut into pieces. Cut the wild boar into pieces and dust with flour. Heat oil in a pan and fry the onions. Add bacon cubes and cook slightly. Turn down the heat and add stock, onion and cloves. Stew until soft for 75 minutes. Ten minutes before the end of the cooking time, add the beer and jam and continue stewing. Take the meat out and liquidise and then sieve the gravy. Place meat and sauce onto preheated plates and garnish with finely chopped leaf parsley. 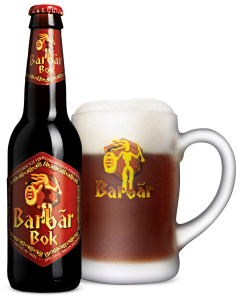 Serve with mashed potato, cubes of baked apple and stewed red cabbage, accompanied by a cold glass of Barbãr Bok beer.